Middleby (MIDD) announced it has acquired Powerhouse Dynamics for an undisclosed amount. Powerhouse Dynamics has developed a cloud-based IoT small commercial facilities equipment monitoring platform named SiteSage. 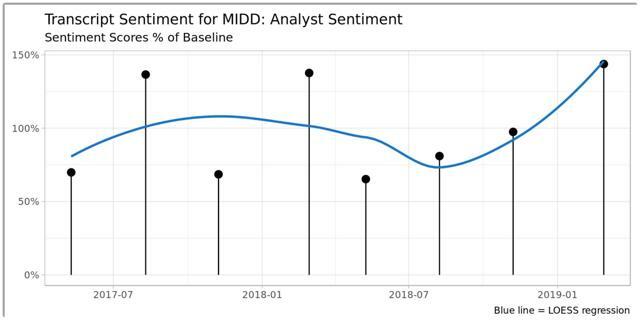 MIDD is investing further in software and services as it seeks to build out its complementary equipment monitoring offerings, increase and deepen customer relationships, and develop potentially new and recurring revenue streams. Newton, Massachusetts-based Powerhouse Dynamics was founded in 2008 to help managers enhance energy and operational efficiencies of portfolios of small commercial facilities, including restaurants, convenience stores, and retailers through its SiteSage platform. Management is headed by CEO Martin Flusberg, who has been with the firm since 2009 and was previously Co-Founder and President at Aclara Software. Powerhouse Dynamic’s primary offering is SiteSage, alongside connected equipment and related services. According to a market research report by Markets and Markets, the global equipment monitoring market was valued at $3.23 billion in 2018 and is projected to reach $4.47 billion by 2023. This represents a CAGR of 6.7% between 2018 and 2023. The main drivers for this expected growth are advances in wireless technology and decreasing cost of IoT devices. The North American region is projected to dominate the market because it is the most advanced in terms of cloud technology adoption as well as rising demand for better security. Middleby didn’t disclose the acquisition price or terms and did not provide a change in financial guidance as a result of the deal, so it is likely that the purchase price was for a financially non-material amount. A review of the firm’s most recent 10-K filing indicates that as of December 29, 2018, MIDD had $71.7 million in cash and equivalents and $2.88 billion in total liabilities, of which $1.89 billion was long-term debt. Free cash flow for the twelve months ended December 29, 2018, was $332.9 million. MIDD has acquired Powerhouse to expand further into equipment management software and services. This acquisition significantly enhances Middleby’s IoT capabilities and expands the offerings to our customers as they evolve the management of their operations through remote, connected and data-driven solutions. SiteSage complements our existing Middleby Connect IoT platform, which is available on many of our existing equipment technologies facilitating our customers with menu management, servicing of equipment and operational monitoring. The combination of Middleby Connect and SiteSage will allow for a single comprehensive solution we can provide to improve efficiencies and manage a broad set of operating issues tailored to our restaurant customers’ needs. With the deal for Powerhouse, Middleby gains access to other industries including convenience stores, retailers, and other industrial users. The SiteSage system will continue to operate as a business unit inside Middleby. What is unclear is whether over time the other manufacturer users of SiteSage will move away, since they will likely not want to have their equipment monitored by a subsidiary of a competitor. In any event, it is clear MIDD management is seeking to prioritize investment in complementary software and service offerings which will serve to provide new potential revenue opportunities that may recurring, subscription-based revenues. The benefit to shareholders is that these revenues are more predictable and smoother while also providing for deeper, ongoing relationships with customers rather than a single up-front sales transaction with maintenance parts only further in the future. As the benefits of Internet of Things capabilities become more widely appreciated, I expect hardware firms of all types to pursue software monitoring technologies in order to maintain or enhance their competitive position in the marketplace. I research IPOs and technology M&A deals. Members of my proprietary research service IPO Edge get the latest IPO research, news, market trends, and industry analysis. Get started with a free trial!